There's a fascinating discussion over at Tara's place regarding scientists and their frequent reluctance to answer interview requests from the media. I commented on this already on Aetiology, but the issue is multi-faceted enough that I think it warrants some reworking and expansion into a separate post. After all, getting scientists and journalists to talk about their respective differences, and the frustrations that sometimes arise because of them, is an important first step in perhaps fostering a better working relationship between the two groups. Because frankly, we need each other, whether we care to admit that or not. Still, Tara says she prefers to be contacted by email, and I suspect most scientists would concur. That's certainly my first avenue of attack, so to speak, when seeking interviews, and it's also my preference when it comes to other people contacting me. But then, I mainly write books and magazine articles, which have substantially longer lead times than, say, a daily newspaper or TV news. Some journalists simply don't have the luxury of sending an exploratory email and waiting patiently for a couple of weeks until a scientist has time to respond, then figuring out a mutually good time to schedule a telephone interview. Under the gun of a tight deadline, cold-calling might be the only realistic approach. It's certainly not the ideal one. Things get a bit sticky later on in Tara's post, particularly when it comes to scientists' fear of being disastrously misquoted or misrepresented in an article. Now, this is a very real concern. It happens all the friggin' time, and not just with scientists. Every one of us who has engaged in any kind of media exposure has a horror story or two to tell. For instance, Future Spouse and I were among those featured in a Valentine's Day article in the New York Times, about couples who met during business conferences (in our case, the 2006 APS April meeting in Dallas). The reporter -- a highly respected professional, and published author -- did his due diligence, and contacted me prior to publication for some minor fact-checking. I clarified a few factual errors. In writing. But the reporter was traveling at the time, and the editor(s) in charge were, apparently, less diligent. Almost none of the corrections were made -- or were made incorrectly, even though they had the correct information right in front of them. In writing! There's absolutely no excuse for that, other than "Oops! Our bad!" "We spend a lot of time crafting our own articles describing our work, adding the requisite disclaimers, alternative explanations, etc., but all that can be undone by a misleading article (or even a misleading headline, which may be no fault of the reporter).... [E]ach new interview is a gamble, so while it has the potential to bring our work to a larger audience, it also has the potential to mischaracterize our work, or piss off a colleague who disagrees with our interpretation of the data." This, I think, gets to the crux of the matter when it comes to the longstanding tension between scientists and journalists. It's a multi-faceted issue, and feelings tend to run high, so it's not surprising that this is the aspect of Tara's post that generated the most heated debate. Honestly, I don't quite get it. It strikes me as a contradiction: on the one hand, scientists loathe mainstream journalism because reporters never get anything right, and yet they're afraid a random article will carry sufficient credibility to damage their careers? It makes no logical sense. Newspapers are not peer-reviewed journals; they should not -- and in my opinion do not -- carry as much weight as a scientific paper published in a refereed journal, which should be the only kind of publication that matters when one's research is being critiqued by one's peers. Unless one's peers are looking for ammo to make cheap shots for political or personal reasons -- in which case, they'll find it regardless of whatever article appears. That's bad scientific manners, not a direct result of bad journalism. "As a science journalist, I can tell you the best thing to do, as an academic getting interviewed and wanted to guide the interview somewhat, is to have analogies cocked, locked and loaded.... [R]eporters go nuts for pre-thought-out analogies/explanations because it's quotable material, and could in fact be the center of the article.... So cranking them out before you speak with someone is a great way to maintain some control of what reporters quote you on." But the harsh truth is, no strategy is 100% effective, and misquoting and misrepresentation will still occasionally occur. (And no, it wasn't better in "the good ol' days." Take a gander at archives from daily newspapers from the 1920s, or 19th century England, if you don't believe me.) Science communication will always be a double-edged sword in that respect: you trade increased exposure for your research, and fostering a link with the general public through the media, for absolute control over the information that's disseminated. Period. So, um, get over it already. "So the answer to a journalist is "stop lying." Stop thinking that constructing an article to make whatever point you want based on totally misrepresenting quotes is ok. Start trying to communicate the *truth* of what people say to you, you know, report what happened rather than what you wish happened because it "made a better story." Then maybe scientists will return your call." Clearly, Drugmonkey has been hurt, badly hurt I tell you, by someone in the mean, nasty media. Let's get a bit more perspective, shall we? It's the rare (and very bad) reporter who deliberately sets out to "lie" in an article. However, it is that reporter's job to shape an article into a strong narrative; that's just good science communication, good story-telling, good writing. It should be based on actual fact, but "truth"? That's a bit more elusive. What Drugmonkey considers the "truth" might be different from what another scientist, or what the journalist, feels is the "truth." Even the most objective scientific data is open to different interpretations, and a big part of any journalistic endeavor is to present more than one side to the story -- the "balance" scientists seem to hate so much. Yeah, yeah, I know this really backfires in extreme cases like Intelligent Design and global warming, but most of the time the model works pretty well. At least the journalist has the benefit of having interviewed several people to obtain a broader view of the matter. He or she might not always succeed in nailing a story to the satisfaction of all the scientists quoted therein, but a good journalist will always try to go that extra mile to ensure a reasonable degree of accuracy. That said, every reporter occasionally cleans up, or massages, quotes. People don't always speak as clearly as they write, and even with written replies, the journalistic format rarely allows for as much context or details as the average scientist desires. Those column inches are precious real estate and every word has to count. Plus, at any moment before hitting the presses, an article can be hacked even further to make room for the all-important advertising revenue. One commenter rather huffily insisted, "Scientists do know what it is like to write something for publication," but said commenter fails to appreciate the substantial difference between a scientific paper or journal article, and the average newspaper story. It's apples and oranges (although they are both fruit). Policies vary from publication to publication on letting scientists review articles or individual quotes prior to publication. The Industrial Physicist, for which I wrote for 10 years before it shuttered, always extended this courtesy -- as a courtesy, mind you, not as a right -- but Discover, Salon, and just about any other mainstream media outlet specifically forbid a reporter from doing so. It really is about journalistic integrity. Believe me, politicians would LOVE to be able to review articles or quotes before they appear in print, the better to spin their carefully cultivated public images. Why should scientists get special treatment? Because they can be trusted to be "objective"? I think not. Scientists are human beings, and they have the same vanities, petty jealousies, and less-than-admirable motives as the rest of the human race, which interferes with their best intentions about as often as occurs in the population at large. It's part of our system of checks and balances that the free press remains just that: free. In short, the scientific community in general needs to be a bit more sophisticated about its attitude towards journalism -- starting with gaining a clearer idea of how journalism actually works, and what its primarily objectives are (hint: they are not the same objectives as science). It is not, and never shall be, just like publishing in scientific journals. And there's nothing wrong with that. It is what it is. As for Tara's frank assessment that there's no "reward" for scientists -- especially young scientists -- to participate in interviews for the press, well, I understand her reluctance, to some extent. There's definitely a negative perception of scientists who participate in public outreach and are quoted frequently in the media -- and more than a little snide commentary behind their backs. (Sniffs Jen-Luc Piquant, "Jealous much?") I can only appeal to your altruism. So I'll just say this: Scientists decry the sad state of science literacy in this country, they complain that much of the "real" science being done is never reported, and they bewail the fact that newspapers are killing off science sections right and left. (I join them in the wailing and gnashing of teeth on that score, and raise them the odd rending of the garment.) But they don't want to return reporters' phone calls because it might tarnish their academic image? Again, it makes no logical sense. If you don't want to consent to interviews, that's your prerogative. I, for one, am sympathetic to all the reasons Tara and her commenters discussed on her recent blog post. But on the flip side, you then forfeit your right to complain about poor science coverage -- because (as I've said before in a prior post) you are a big part of the problem. It strikes me as a contradiction: on the one hand, scientists loathe mainstream journalism because reporters never get anything right, and yet they're afraid a random article will carry sufficient credibility to damage their careers? It makes no logical sense. I heard it said once that "every article you read in the newspaper is completely correct, except for that rare article about which you have some firsthand knowledge." I haven't been horribly scientifically misquoted myself; I haven't been quoted a lot in the press at all. There was some press at the time of the Knop 2003 accelerating Universe paper. The worst thing about that was in a very small local paper that had the title, "Universe is expanding." 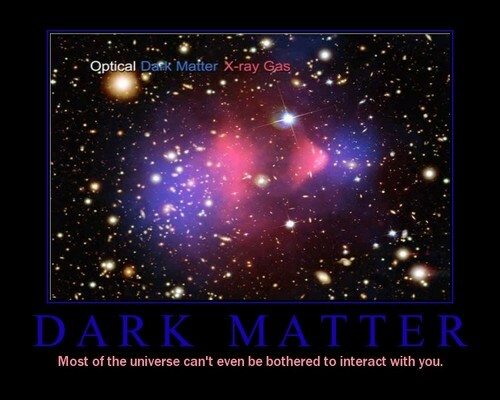 Some people sometimes say that I was on the team that discovered the expansion of the Universe. (Really, guys, I'm not as old as I look.) So I haven't personally been involved in this. However, I have seen multiple family members go through a huge amount of pain because of either deliberate character assassination, or because of a small mistake that got echoed by lots of other newspapers... a mistake that happened to amplify the alarmist impact of the story. People tend to believe what they read in the newspapers. Other scientists will think, Hmm, Professor A said X. If you can set them straight, great, but bear in mind that your grant proposals are reviewed by people whom you don't regularly communicate with, that your tenure letters are often supposed to be written by people who know your work but whom you don't communicate with.... If we're misquoted in the media, we do not always have a platform to set the record straight. What's more, we're ultimately judged by administrators who often as not are clueless about science, and while they'll look at your publication record as a list, they will have an easier time understanding mainstream newspaper articles than our real work. Yes, they're influenced by recommendations and such written by people in our field, but bad misquotations that make us look bad to our administrators can hurt us. So, it's not a logical contradiction at all, but it follows logically. We're worried that newspaper articles will hurt our career because too often the mainstream press screws up the science (and, in my experience, almost anything else). The fact is that among most, newspapers do have credibility, even if perhaps we're all credulous for giving them as much credibility as we do. Oops -- I keep forgetting that HTML doesn't work in the comments here. The first paragraph of that last comment was supposed to be in italics, as it was the quote from the original post to which I was responding. "However, it is that reporter's job to shape an article into a strong narrative; that's just good science communication, good story-telling, good writing. " The problem is when people start thinking that scientific research follows some sort of narrative structure, so that they need to be retrained. There's also the 'loser' stigma- the view that peole who give a lot of public talks and interviews are doing so to make up for the fact that they are no longer invited to review papers, collaborate on research, get grants, etc. I must agree with one of Rob Knop's points: ADMINISTRATORS. You can tell the accurate truth, be quoted correctly, and if that happens to hit one of your boss's buttons, your life can turn into a living Hell. And unless you are a very large scientific fish, there are a LOT of administrators above you in the food chain. They don't know you, you don't know them, and every one of them is a land-mine waiting to go off if you step on one of its trip-wires. "Honestly, I don't quite get it. It strikes me as a contradiction: on the one hand, scientists loathe mainstream journalism because reporters never get anything right, and yet they're afraid a random article will carry sufficient credibility to damage their careers? It makes no logical sense." To quote **Star Trek IV,** "Whoever said the human race was logical?" The premise involved here is, I think, "Journalism is not to be relied upon." Call this proposition P, if you'd like. Scientists accept P, so the story goes, when they tell each other that "reporters never get anything right." However, they appear to **deny** P when they're afraid that journalism will hurt their careers because somebody, somewhere relies upon it. P and not P.
It's only a direct contradiction if everybody, everywhere accepts the proposition P. If everyone in academia -- everybody with input on funding or tenure decisions -- knew that journalism couldn't be trusted, and if everyone was fully aware of what all the other people thought, then who would give a damn? The problem happens when **you** don't trust reporters to get the story right, and you worry that **other people** won't see the situation as clearly as you do. I think this is a reasonable worry, although the spectacle of everybody thinking they're the only ones who can see the truth is a trifle silly. Of course, nobody is likely to **read** Dr. Gregory's corrective essay, unless they're already a science enthusiast who happens to get pointed to it by another science-themed blog. While this may foster an increasing level of hostility among net-savvy science buffs, stoking their antagonism against mainstream journalism, that's not (directly) a helpful outcome. This is one of the times when I admit to a libertarian impulse and suggest that when **Wired** puts out a stupid article, **other magazines** should jump into the act and, fueled by the professional scientists pumping napalm through the blogotubes, breathe journalistic fire. Does **Seed** just want the web traffic from ScienceBlogs.com, or are they willing to use their not-so-tame dragons as a resource? Competition, man, competition. Markets are a **tool,** you know, so let's give them a place in our toolbox. I've been interviewed by several very conscientious reporters who will repeat what I said in their own words and ask, "Is that right?" Some will check back with me before publication to verify facts. Others seem to hurry to put together something before a deadline and turn out a work that is inaccurate, poorly written, and in some cases totally wrong (reminding me of some of the things that my students write). The latter tend to turn off professionals. There are several people in my department who absolutely refuse to talk to the media because they have been misquoted and misrepresented on multiple occasions. All to many reporters report on science topics without knowing anything at all about science, and they don't want to take the time to learn about what they are reporting. I know that I've had reporters interview me and then totally botch quotes (isn't there something unethical about putting down words that someone didn't say, putting quotation marks around those words, and attributing them to that person????). I've had stories go into print that are factually WRONG, and then attribute those "facts" to me, though I said nothing of the sort. I often feel embarrassed when I read that, wondering what knowledgeable people will think of me when they read it. One newspaper even gave my title as Professor of Astrology, and even misstated the name of my college! That was particularly hard to believe, since I had given him a business card with the correct title on it! So, I can understand why so many professionals refuse to talk to the media. But, I still do grant interviews when asked. I think that it is important for us to communicate with the public. And, the mass media is the usual way that the public finds out what is going on. But, I do try to get a feel for the person interviewing me, and I try to make sure that they understand me. Sometimes you have to do the right thing, consequences be damned. Talk to the press. Raise all hell if the story is inaccurate. (I love the idea of using web-magazines to police other news outlets.) By the way, the academic administrators are being just as incompetent in carryng out their duties, as the reporters, in such situations as are being feared by those afraid to talk. Maybe those administrators need to be educated too in such situations. Sometimes only martyrdom makes the point, I'm sorry to say.... We all want a fair world, but... This is life. Put yourself on the line. Thanks again to Jennifer for her voice of reason! On the Media already covered this issue from a more general perspective. See "Just Email Me" from the 5.25.2007 issue. The internet and blogs present a potent tool to counter inaccurate information in journalistic media. I suggest that any scientist being interviewed obtain a voice recorder and record the interview if the journalist won't do it by email. If you have an iPod, get an iTalk. They can be had for $20 or so on eBay. Post the mp3 and let anyone who cares listen. That's what Jason Calacanis does. Mr. Calacanis points out that a journalist working for Wired, ironically, won't do an interview by email. I do want to interject that despite the "side" I've been arguing in my comments, I am not 'anti-media,' and have (on the very rare occasion when it was warranted) happily agreed to interviews with journalists. However, also as somebody who's in a precarious position regarding being able to *stay* a scientist, as well as somebody who's listened to administrators talked over the years and has watched University administrations work over the years, I'm fully aware of the dangers that all of us face, especially those of us who are pre-tenure. And, I can *easily* understand why somebody else might not want ever to talk to the media for fear of being misquoted. As I've said, I've seen the media do terrible things that had severe personal consequences for their subjects in some non-science areas. My main point is one of the points that Jennifer makes in her last paragraph. I can fully understand the reasons why some would hesitate to talk to the media. My secondary point is that given that the reasons are understandable, it's not really fair to chastise those, especially those in precarious positions, for not putting their own welfare on the line to fight the good fight in the face of what at least seems like inevitable personal suffering while changing nothing materially. "If you don't want to consent to interviews, that's your prerogative ... But on the flip side, you then forfeit your right to complain about poor science coverage -- because (as I've said before in a prior post) you are a big part of the problem." I didn't understand this in the prior post and I don't get it now. It sounds like a non sequitur to me. Nice troll. "particularly angry" really? why? because I suggested journalists should stop lying? Or would this perhaps be yet another exhausting example of the journalist mindset to go for the sensational over the mundane with little care for the truth of the matter? To clarify for readers of your trolling, my comments over on Aetiology are quite obviously focused on the phenomenon Mike the Mad Biologist has termed "predetermined storylines and quote mining". You, however, have chosen to seize on my quote to further an argument regarding legitimate scientific debate. This has nothing to do with the aforementioned quote mining issue to which I referred in which the "truth" at stake is whatever the quotee is trying convey regarding his or her opinion. That, surely you agree, is not up to the judgment of the journalist and the proper role is to convey the quotee's opinion as accurately as possible or not at all. When the least representative quote from a 40 min conversation makes it into an article, well, this can hardly be construed as anything other than intentionally lying. Plenty of journalist apologists participating in this blogostorm insist that this sort of thing is rare. If so, why do so many of us have examples of this shabby treatment? The fact that this critique is so similar to ones commonly advanced in the political journalism arena suggests that the problem is the journalism profession, not the ability of scientists to communicate. >specifically forbid a reporter from doing so. Personally, I like talking to reporters and media people. I think it is our responsibility as scientists, but I also actually enjoy explaining my work to interested people. But I honestly don't understand why these print media have these policies that Jennifer refers to above. I do understand of course that scientists are not immune from wanting to craft a reporter's story to paint themselves in the most favorable light, but the reporter doesn't have to change anything that the scientist balks at. On the occasions that my quotes have been used out of context - or words put in my mouth - they had the affect of making the case for something that was demonstrably untrue. Both the reporter and I looked ignorant. Such occasions could have been avoided had the reporter let me see the article before hand.... Such an arrangement would have been to the benefit of both of us. The reporter gets the facts right and I don't get misquoted. If the reporter felt that I was being manipulative then they can just ignore my comments. I can't see how running an article past an expert source could detract from an article. Comments? Rob says "I can fully understand the reasons why some would hesitate to talk to the media. My secondary point is that given that the reasons are understandable, it's not really fair to chastise those, especially those in precarious positions, for not putting their own welfare on the line to fight the good fight in the face of what at least seems like inevitable personal suffering while changing nothing materially." You are right, Rob. I take my comments back. Everyone has to pick and choose their battles; you can't fight them all; and there are certainly cases such as you describe. If a tongue-in-cheek teasing comment elicits this kind of response from you, then you ARE angry, at me, at the media, at the world, the very unfairness of life -- even if you don't want to admit it. Screw journalists! And then after that, if you don't like it, you can do them a bad turn. But seriously, journalism is about as useful these days as sperm whale oil. If a scientist needs to get a point across, that can be done directly--bypassing journalists. Journalists once had a stranglehold on the flow of information to the public. No more. Hmmm, what might be an appropriate level of response to Organgrinder? Aha! "I know you are, but what am I?" Seriously, if the above is an example of Organgrinder's communication skills and powers of persuasion -- well, good luck with the do-it-yourself approach to "getting your point across."